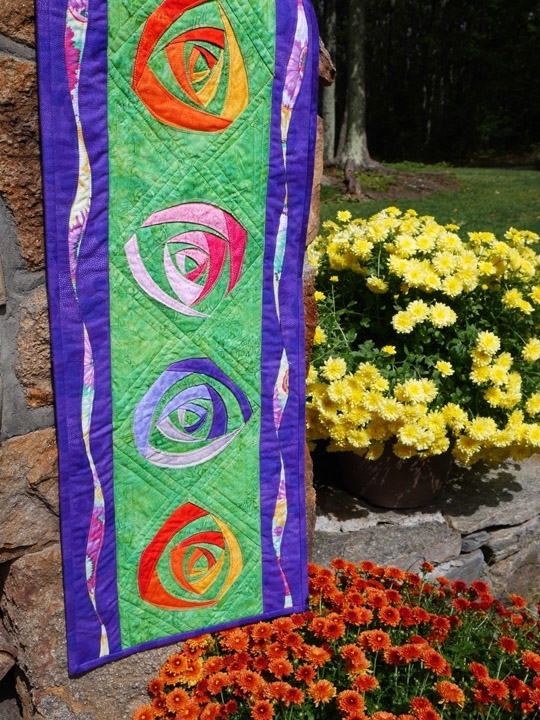 Ease	into	gentle	free-form	topstitched	curves	in	this technique	and	design	workshop. We	will	make	abstract	flowers	that	twist	round	and	round	and	pairs	of	Layered	Leaves	embellished	with	yarn. Then	experiment	with	different	combinations	to	see	which	design	layouts	appeal	best	to	you for	making	your	choice	of	a	wallhanging,	table	runner,	table	topper,	a	bag	or	the	beginnings	of	a quilt	top. Sewing	Machine	with	straight	stitching	foot ! Thread	(solid	or	variegated):	one	spool	of	thread	to	match one	of	the Color	Twist	fabrics	and	one	spool	of	thread	to	match	one	of	the	Layered	Leaves	fabrics.	! Basic	sewing	supplies:	pins,	scissors,	etc…	! Rotary	cutter,	mat	and	ruler ! Marking	pencil ! Iron	and	mat ! Yarn:	scraps	of	contrasting	colors ! OPTIONAL: WIGGLES & WAVES (book): Wiggles, leaves and logs. What do they all have in common? Curvy lines! 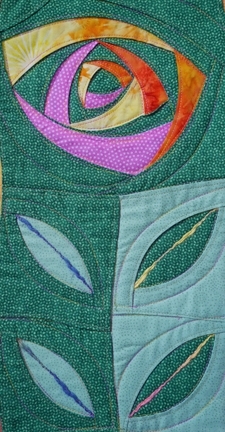 This book is all about Free-Form topstitched curves.